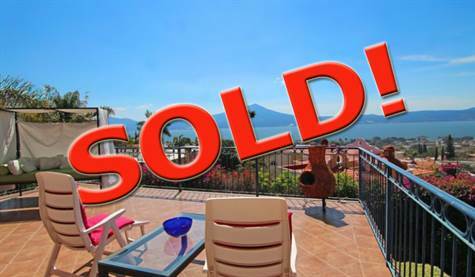 SOLD $449,000 USD Fantastic Lake Views !!! "Solid construction, Guest Casita !!!" Garage: Double, Attached "one covered, other uncovered"
If you are looking for Lake views in a solid built home, this it !! !, this house is structurally sound and has no one single crack, it's a very well built home and all the spaces are quite generous, ample & spacious. The main house is all set up in one level with 5 bedrooms and 4.5 baths (Includes one room & bath for a supportive nurse or maid's quarters), has a very ample kitchen full of storage & island with stools and connects with the laundry room, maid's quarters, garage and workshop. From the street you have a gate that guides you to an open patio with a fountain and a Gazebo with BBQ area where you can enjoy your dinner with a great mountain view. Then you can go to the main entrance, through a Foyer that opens up to the living room with a gas fireplace and then to the covered terrace that has 2 wings the east is the family room and the west is a wet bar, both areas takes you to an open terrace with an outstanding lake view. Under the main house and as part of the foundation a guest home or casita was built as well as a huge water cistern (estimated 30,000 liters or 7,900 gallons of water reservoir) and has one bedroom with walk-in closet, one full bathroom and kitchen and living room, outside you have a covered terrace, garden and parking space for one vehicle.